Oh jazz, you crack me up. On our way to work today and giving her toy the bizness in her travel cage. 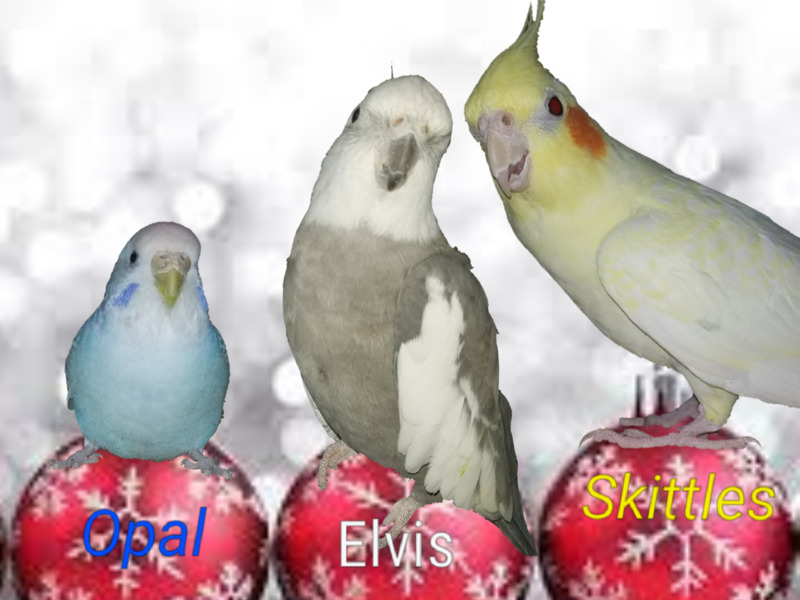 a budgie, and 2 cockatiels. Elvis did that with a plastic ball I had in his cage once. I thought Jazz was a female. well, her colors changed... err... HIS colors lol so she is most likely a he. Yeah, Jazz is definetly a male. Female normal grays will not have so much yellow on the face, and they will keep the wing spots and tail barring. Can we see a pic of an extended wing or the underside of the tail just to be sure? Yumm...little Beebers has a bunch of toy's in his house. At times I hear all this banging and clanging and GROWLING only to look over and see BB beating the CRAP out of his bell,or one of those toys that has colored paper strips hanging from it. I mean,he gets soooo engrossed with it lol...When I see him doing that,I ask "BB?? What the heck are you doing??" and he'll look at me and say "HUH?" ( learned that from Amy) and go right back at it! I can't help but LMBO!